Spring has arrived here in Madrona. And after a few days of Summer we are back to the usual pleasant mix of sun and showers. The days are as long as the nights. It is the perfect weather for tasting wine. Saturday we are in Veneto with wines from Contra’ Soarda and Vignalta. Contra’ Soarda, besides making great wine has herd of small donkeys that they use to work the steep vineyards. Sunday we head to Austailia. Aromas of white flowers and honeysuckle dominate the nose, with ginger and five spice to finish. The white flowers and ginger lead into a creamy mid palate with a silky textural finish. The wild fermentation and lees aging give the wine an extra level of complexity on the palate. Los Companeros greets the nose with seductive blueberry fruit framed by suggestions of chocolate, mint, earth, and spice. On the palate, this wine is rich and dense yet approachable. The concentrated dark fruit and chocolate are tempered nicely by fine, silky tannins and balanced acidity. and get your April box. but still want to try new and interesting wines? for yourself, or for a friend as a gift. Good quality wines that don’t require a special occasion. This club gives you wine for good, everyday drinking. These selections from all over the world are meant to go with food. If you buy two or three bottles a week at the grocery store, we promise you that you’ll drink better with this club! Pick your favorites and come back for more. Your choice of either six or twelve bottles a month. Choices all red, all white or 50%/50% or 60%/40% or rosés or bubbles. Classic samplings from around the world. It could be a new Cabernet from Walla Walla, or an old Barolo from the Piedmont, but they all will be excellent wines that represent their place and style. We’ll pick from some of the most exciting wine we find each month. Take our choice or tell us your preferences, and we’ll hand pick to your interest. The 3M All Week Mix offers two bottles from the Saturday Night Collection and four bottles from the Everyday Exploration so you have bottles for special occasions and bottles for every day. Saturday we are featuring some French Country Wines from small, sustainable, organic and more natural producers. Sunday we are off to Bordeaux with two wines from Château La Maroutine. The plots of Château La Maroutine are situated on the slopes of the Saint Germain de Graves village at the south part of the Cadillac. A family estate since 1789 and bought in 1942 by Jean Darriet, a 6th generation winemaker, Château La Maroutine has been gradually restructured. Now the 8th generation is beginning to leave their imprint. This weekend we traipse the vineyards of France, tasting the terroir as we go. The wines on Saturday come from Petit Monde, a local distributor which focuses on small, sustainable, organic and more natural producers. What’s that all mean? Come find out. Château de Breze, an enormous medieval castle that overlooks Saumur, one of the Loire’s most scenic towns, has produced wine since the 15th century. The Château’s crisp, chalky sparkler is made in the Champagne method with organic winemaking methods, indigenous yeasts, and 24 months of aging on the lees. The bead is surprisingly fine and pure, and the nose and palate practically ring with fresh fruits, mineral and golden strawberries! From Brittany France, this crisp dry cider has notes of heirloom, crab, & green apples, lemon, stone fruit, pineapple, and mineral. Couet’s Coteaux-du-Giennois comes from clay, limestone soils and flint, clay soil in the Loire. The nose opens immediately on beautiful exotic fragrances (passion fruit, grapefruit). The mouth is a model of balance: the size, quickness and length give it an elegance and remarkable harmony. While nowadays neighboring St. Émilion gets all the press, there was a time in the 18th century when Canon-Fronsac was the most sought-after Bordeaux region. Although it is no longer poured at the court of Versailles, wineries like Château Lafond are still making full bodied wines with balance. This Fronsac has notes of ripe cherry, plum and blackberry flavors with an underlying tannic structure. This 9-hectare estate is situated in the village of Calce in the Roussillon The vines are grown strictly according to biodynamic principles. Named after Olivier`s son, My Little Pithon is a wine made from young vines, with garrigue character. The wine has rich red fruit on the palate alongside an elegant minerality. This weekend at Madrona Wine we are exploring Italian terroir. Terroir is how a particular region’s climate, soils and terrain affect the taste of wine. we’ll be tasting through a full line up both Saturday & Sunday. Sunday is also the Artist Reception for our new show. Scroll down for more info or just come on by for a look. Sunday we have a pair from Piedmont. Hints of white and citrus fruit notes of savory and freshness. Organic. Fresh, with mature plum scents this easy drinking Barbera is great with dinner or by itself. Sunday 3pm to 5pm is the Artist’s Reception for our new duo show by Amy Hanada Nikaitani and Michelle Kumata. 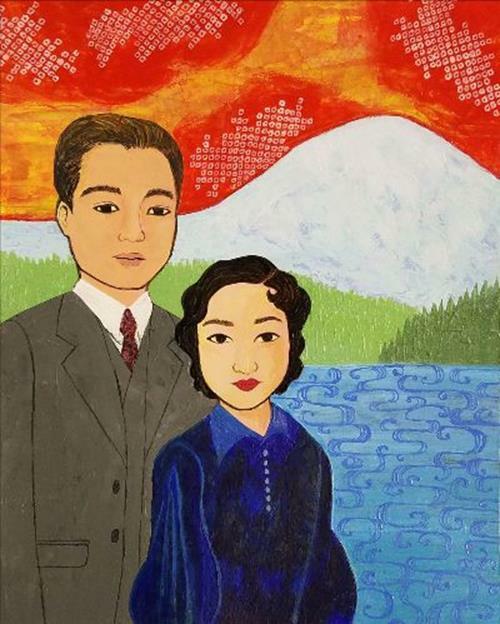 Michelle Kumata’s Nihonmachi series is based on pre-WWII photos of the Japanese American community, when Seattle’s Japantown was a bustling, vibrant neighborhood. The imagers were inspired by found photos and the Takano Studio Collection at Wing Luke Museum of the Asian Pacific American Experience. Amy Hanada Nikaitani was born in 1923 on Halloween Day in Seattle, Washington in a hotel near 6th and Weller which her father operated. Imagine, now she is living in Washington Terrace on 6th and Yesler!!! Born to immigrants from Japan, Kuramatsu and Matsu Takami Hanada. She had been interested in the female figure all her life, playing with paper dolls as a child, drawing fashion figures and bathing beauties on her notebooks and also on her stationary as she corresponded with many GI friends during WWII. After high school she hoped to attend art school. Her father, concerned for her financial security, sent her to the Charette School of Costume Design in Seattle, instead. She had only started her studies, when World War II and the internment orders interrupted her plans. Her entire family moved to Wyoming to avoid the internment. From there, she married and became a mother of four. She put her artistic aspirations on hold, but in the back of her mind thought she would return to art someday. While raising her children she attended Edison Technical School and studied at the Burnley School of Art. After having a fifth child she went to work at Boeing in a Graphics Group for 18 years. 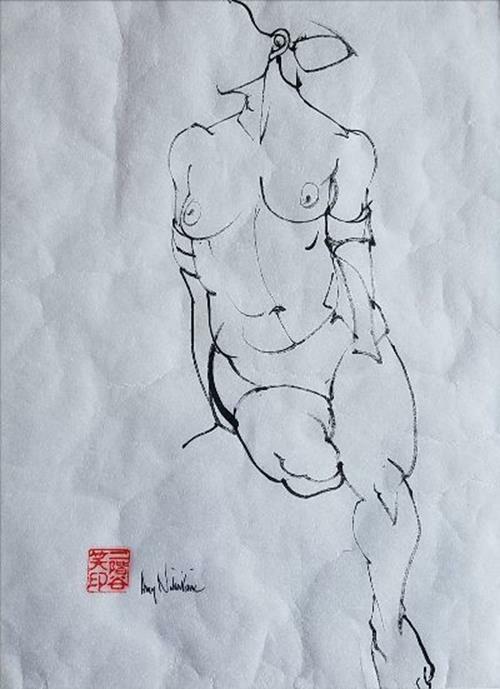 During this time she continued her interest in the female figure, becoming a fixture in local figure drawing groups. Tenuta Col Sandago is set amidst the splendid hills of the Conegliano Valdobbiadene DOCG region in the prestigious March of Treviso. The Glera grapes benefit from the land’s unique physical characteristics. The exposure, the slopes, the altitude and the microclimates all contribute to creating crisp Prosecco. The wine has a fine and persistent mousse with a pleasing, characteristic fruitiness. The palate is slightly velvety, balanced and lingering. The valley of Matelica, called the Camerino Syncline, is the only one in the entire Marche region that runs parallel to the sea creating a unique continental microclimate, since it’s not influenced by air currents coming from the Adriatic Sea. Made with organically farmed grapes, this delicious white opens with aromas of citrus blossom and white stone fruit. The tangy, medium-bodied palate offers a lovely depth of flavors that include juicy tangerine, lime, white peach, bitter almond and mineral. Crisp acidity brightens the rich flavors and carries through to the clean finish. The Filodivino draws its character from the minerality of the calcareous soil and salinity from the nearby Adriatic Sea. The wine has a fragrance of violets, dog roses accompanied with currant, blueberry and blackberry. In the mouth, the flavor is all enveloping, softened by scents of fruits of the forest, wild strawberries and bramble coupled with good structure and soft, refined tannins. Tiziano Mazzoni farms just 4.5 hectares of vines and produces about 1,200 cases of wine per year in the “alto Piemonte” region of Ghemme. This higher elevation region of the Piedmont produces Nebbiolo that are radically different from Barolo or Barbaresco. The Colline Novaresi is a light and very pretty Nebbiolo with aromas of red plums, red cherries, red and pink roses, light pepper. It is suave and silky, fine-grained tannins. The Madonia estate extends over 35 acres on the sunny ridge of the magnificent hill of Montemaggio, in Bertinoro, the heart of Romagna Wine District. The vines are trained in the “Alberello” or “Bush” system, which allows the clusters a more consistent sun exposure throughout the daily cycle. Here, the plants benefit from an optimal southwest exposure, and the yields are kept at minimum for the best fruit quality. The vines are intermingled with olive groves and wild forest, whose scent is blended with the pleasant breeze coming from the Sea, only 5 miles away. Inky dark, the wine opens with aromas of underbrush, vanilla and black-skinned berry. The dense palate delivers ripe black plum, toasted oak and tobacco alongside assertive tannins and the warmth of alcohol.